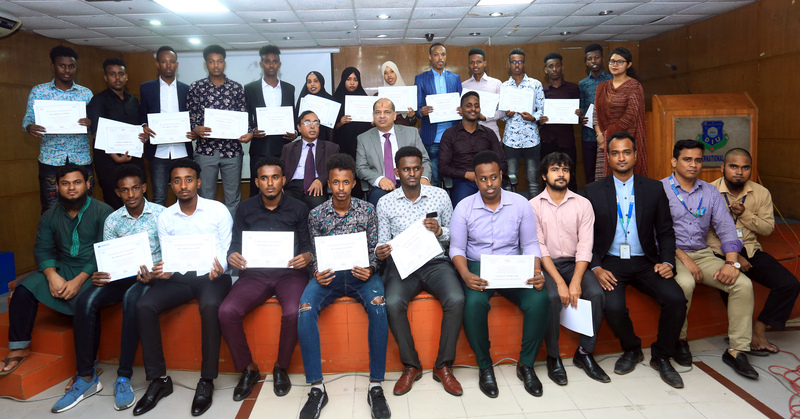 The certificate distribution ceremony of the Certificate Course on Entrepreneurship Development (CCED) organized by Career Development Center (CDC) of DIU in association with Department of Innovation & Entrepreneurship of Daffodil International University was held on 01 April 2019 in 52 Milonayton, Daffodil Tower, DIU, Dhaka. Professor Dr. Yousuf Mahbubul Islam, Honorable Vice Chancellor, Daffodil International University was present in the occasion as the Chief Guest. The program was presided over by Mr. Abu Taher Khan, Director, Career Development Center. On behalf of the participants, the event was also addressed by Mr.Abidullah Afif, a student of Department of CSE. Professor Dr. Yousuf Mahbubul Islam delivered his valuable speech in the occasion with a very touchy words that every students should be enriched with their self-esteem. He asked the participants of CCED to develop themselves as entrepreneur by utilizing their knowledge and ideas acquired from this course. He also asked the international students to take part in the forthcoming African Students Conference (ASC) to be held on 11 May 2019 with their business ideas. He expressed his ambition with the expectation that the said ASC will help to enhance bi-lateral economic and diplomatic relationship among Bangladesh and African countries. A total of 50 participants including local & foreign students and alumni of DIU and other Universities participated in this 3-month long training course.At the end of the event, HonorableVice Chancellor Professor Dr. Yousuf Mahbubul Islam distributed certificates among the participants. It may be mentioned here that, this Certificate Course on Entrepreneurship Development (CCED) was started on 20 October.The next 3rd batch of CCED will be started in June 2019.